The narrow, unpaved road snaking through the desert of Upper Egypt does one thing. It connects visitors from Al Minya, the capital city of the Al Minya governorate, to Bishop Samuel Monastery, a Coptic Orthodox institution. The road with no name was carved out for this purpose in the 12th century. Today, as in ancient day, only Christians have use for this road. Not a soul dares this trip when the Winds of Kamasin whip up the sands from across the great desert in May and June. The air is unbreathable and the road disappears. Traveling the 25 kilometer stretch means a one hour bus ride with no spurs to turn off. One step from the road’s edge could sink a man to his knees. The absence of Bedouin bears out the vast emptiness. Unlike the Sinai, migrants are rarely seen in the Western desert. To be on this lonesome road is to be alone with the Creator. Only the very committed have an interest – man, woman and child. The journey by bus is made once a week. to say the “Our Father” [praying] in a loud voice for fear of them. Terrorists pointed their firearms toward her. over me and my daughter [his sister] until he took the shots instead of us. he died. I noticed my clothes were soaked with his blood. In spite of explicit threats from ISIS toward Egypt’s Coptic Christians after the recent terror attacks (45 days earlier) of the Cairo, Tanta, and Alexandria churches, many devout Coptic families in Al Minya gathered in the early morning hours of May 26 for a planned trip to Bishop Samuel Monastery. Copts have never allowed terror to shut down the practice of their faith. Fourteen hours later many arrived at the monastery in wooden coffins – Orthodox protocol bypasses hospital mortuaries in cases of terrorism. At gunpoint, the passengers were given a choice; say the “Shahada” (conversion to Islam) or die. 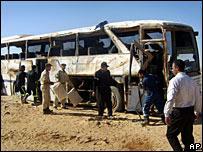 The bus was sprayed with bullets — killing 34 and injuring 20. In deference to 7th century Medina and the Prophet’s first use of conversion by sword, looting began. The holy followers of the “religion of peace” grabbed Egyptian pounds, cell phones, and gold jewelry worn by the passengers – mindful that gold crosses, however anathema, convert to dinars. Two and a half million Christians make up half the population of Al Minya. The majority are Orthodox Christians. Until now, violence has been inflicted in the expected ways: church bombings, home burnings, gang beatings, rapes, kidnappings, Molotov cocktails, and police brutality. The May 26 attack was a novelty – a military-style ambush in the middle of the wilderness – expanding the methods of terror used against Christians. The threat of terror cells crossing Egypt’s borders into Egypt’s interior can now be added to the constancy of homegrown Muslim Brotherhood-inspired terrorist gangs. Law enforcement protecting Copts has always been weak, and now we see the army’s defense of the country’s borders also weak, at least when it comes to the Copts. Although Al Minya has the highest concentration of Christians in the country, its law enforcement did nothing to heighten security or alert communities and churches after Libyan authorities informed the Egyptian government of a plan where ten men would cross their western border into Egypt to commit an act of terror (potentially in direct line with Al Minya). There were also no efforts made by the Egyptian government after the American embassy warned Egypt of a possible terrorist attack on their soil. To make up for it, within hours of the attack Al-Sisi retaliated with airstrikes on Darnah, Libya – the same response he had two years earlier to vindicate the beheadings of 21 Copts in Libya. It failed to be a deterrent. Furthermore, Al-Sisi’s lack of follow through from that time forward allowed a climate of violence accommodating the May 26 event. According to the Italian Agenzia Fides (June 9), Egypt’s Interior Minister, Magdi Abdel Ghaffar, during a June 8 meeting with high security officials, stated, “…that churches and monasteries will be at the center of appropriate security measures,” and “…that the state of emergency urges to reduce visits to churches and monasteries.” According to Agenzia, the state apparatus is also advising Christians to avoid “to gather conspicuous crowds at places of worship and prayer” during this emergency phase. Ironically, mosques have had state security in place for a few years without the crime statistics to justify the measures. As long as the state deemed this necessary, Muslims were never advised to stay away, avoid worship and stop praying — probably because none of it was necessary. However, now the double standard feeds a divisive message. For Copts, it means one thing — subjection to Sharia law cloaked in national security regulations. Civilization jihad is being accomplished through state directives that intersect religious Islamic law and, conveniently, the emergency phase can last indefinitely. Meanwhile, Muslim gangs act independent of the state (at times complicit with them) on the Sharia mandate to stop Christian worship and prayer by physically attacking Christians praying in their homes, and police follow with arrests of Christians. For example, for praying in a home on October 27, 2016 Copts were arrested in a town called Awlaad Ibrahim in the province of Asyut (Upper Egypt) — their closest church three miles away. Copts were denied government permits to build even one church in the town (there are 22 mosques). In April 2017, Islamists attacked and killed four Copts for praying in a home in the town of Koum Alufy of Samallut Center in Al Minya governorate having earlier been granted permission by the local police to pray (required by law for Christians not Muslims). It is a persistent threat. In effect, the warning by the Egyptian branch of ISIS on May 5th to all Egyptians to stay away from public buildings and Christian gathering places has been suspiciously whittled down by the state to call for religious restrictions on Christians alone. The state’s transparency is further indicated by its lack of concern for the welfare of Christians when it was unable to muster a timely warning to Copts or provide them sufficient security when the ISIS May 5th threat was imminent. Most Middle Eastern countries crushing Christians are a war zone. Little can be done by the individual to effectively counter it. In the case of Egypt, a state clearly in violation of the UN Declaration of Human Rights, a tourism boycott is now in order until we see more than deception and lip service. Planned for 2018, Dr. Ashraf Ramelah and the Voice of the Copts’ organization will open a safe haven/learning center (La Casa Futura project) in Rome, Italy for Coptic Christian youths fleeing from Egypt. Please visit www.voiceofthecopts.org/programs for more information and to help.